I love Huff's Keepers Chronicles. They have everything I love in a good book. Humor, plot, quirkiness, fun characters I like, and a really cool premise. And who can resist a talking cat and a Hell that talks to itself? a day Diana Hansen had been anticipating for the last twelve years. Now her real life could begin...For Diana, like her sister Claire, was a Keeper--gifted with the ability to reweave the possibilities of time and space to maintain the balance between Light and Darkness. What neither Diana nor Sam--formerly an angel, now a cat--could have anticipated was that her first Summons as an active Keeper would be to a shopping mall! Finished this the other night at work. Once I got into the middle of the book I couldn't put it down. I have to say, it wasn't quite the same as the previous two books but still it was very complelling reading. It has the same quirky sense of humor as the first two and some really interesting characters that appear. I have a feeling we're going to end up seeing more of a couple of new characters introduced in this book. This book is not all about Claire. Some of it deals with Diana and her first real Summoning. Other parts of it deal with Dean and Austin. 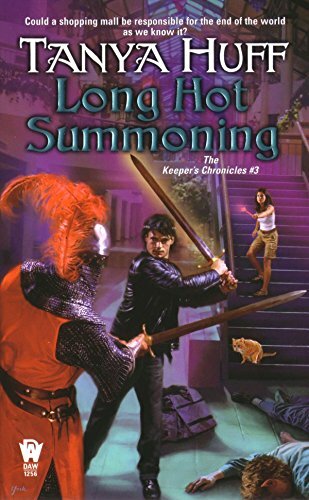 All of it is just as funny as you'd expect The Keeper Chronicles to be.